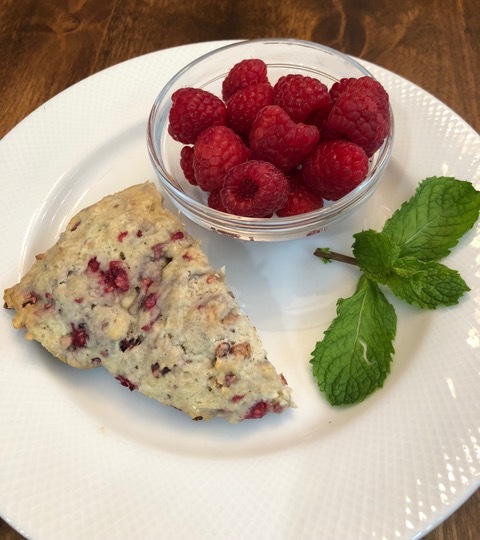 The week we have a review of the latest Secret, Book, and Scone Society novel by Ellery Adams, and a fun recipe from Ellery. Details at the end of this post on how to enter to win a copy of The Whispered Word, and a link to purchase it from Amazon, and an indie bookstore where a portion of the sale goes to help support KRL. Miracle Springs, North Carolina, is where people come to heal, find peace, and enjoy the natural hot springs of their popular spa. It is also where Nora Pennington has opened her bookstore Miracle Books, where she utilizes her unique “bibliotherapy” skills to match the customers with the perfect books they need in their lives. No one requires her skills more than “Abilene,” a poor waif Nora found curled up in the bookstore wrapped in bubble wrap and donning a hospital bracelet. While reluctant to pressure the vulnerable young woman for information, they discover that she adores books and has an enviable talent of making window displays out of packing materials. 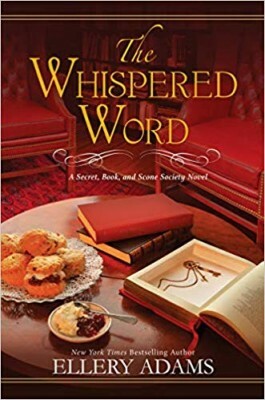 Although the Secret, Book, and Scone Society formed when Nora, Estella Sadler, June Dixon, and Hester Winthrop bonded by sharing their most painful secrets, they allow Abilene to keep hers. At least that’s until a delivery of gift baskets to residents devastated by a recent banking scandal has the ladies discovering the body of Nora’s least favorite customer, Amanda Frye. Through knowledge of Amanda’s precious treatment of her own books, Nora spots a clue that indicates that Amanda was not alone at the time of her death. Along with the surprisingly cooperative new Sheriff Grand McCabe, Nora discovers Amanda’s valuable book collection, an angry heir more than ready to accept his due, and the shocking secret kept by the young woman with a connection to the victim. This is a heart-warming series sure to please anyone who has found comfort and pleasure in books. Nora’s past left her with both emotional and physical scars, and it is only by acknowledging her pain and guilt that she finds a way of moving on. An unexpected chance at a new beginning continues the promising romance with paramedic Jed Craig, although they realistically stumble along their way towards happiness. Readers will delight in taking note of the titles Nora prescribes for her customers’ mental and physical health, and empathize with those seeking comfort for their pain. By the end of the novel, Nora will seem so vivid and relatable that a violent confrontation will have readers wincing and holding their breaths in anticipation. One hopes that reading and books truly can provide refuge and healing for real-world traumas, and this series provides examples that should be followed for those looking for escape as well as answers to life’s challenges. Ellery Adams has included an interesting Reader’s Guide for The Whispered Words for use in a book club setting. Gather your gals together to enjoy the book and discussing it afterwards. In a medium bowl, combine flour, baking powder, and salt. Add the chilled butter and mix with your fingers. In a small bowl, add sugar, buttermilk, egg, and vanilla. Mix well. Pour liquid mixture into flour mixture and gently mix until the two are just incorporated (I like to use my hands. I rinse them in very cold water or spray them with cooking spray first. That way, the dough won’t stick to my fingers). If your dough is too dry, add more buttermilk. If too wet, add a bit more flour. Your dough will be sticky. When it’s at the desired consistency, add raspberries and chocolate chips. Some of the raspberries will color your dough pink. That’s okay. Gently fold the berries and chips into your dough. Do not overmix. The more you handle the dough, the tougher your scones. Form dough into a ball. If you have time, chill dough in bowl for 15 minutes before continuing. When ready to bake, turn dough out of bowl onto lightly floured surface. Using your floured hands or lightly floured rolling pin, shape dough into 8-inch circle and use a pizza cutter to form 8 equal-sized wedges. Using a floured spatula, transfer wedges to baking sheet. Scones should be at least 2 inches apart. Brush egg wash over scones and sprinkle with sugar. Bake for 20-25 minutes. Scones should be a light golden brown when properly baked. Let cool. Enjoy with clotted cream or fresh jam. Or both! To enter to win a copy of The Whispered Word, simply email KRL at krlcontests@gmail[dot]com by replacing the [dot] with a period, and with the subject line “whispered,” or comment on this article. A winner will be chosen January 26, 2019. U.S. residents only. If entering via email please include your mailing address (so if you win we can get the book sent right out to you), and if via comment please include your email address. You can read our privacy statement here if you like. I really enjoyed the first book and I do hope to read this one soon. Thank you for the giveaway. I do want to read this book. The recipe is perfect and sounds delicious. Thank you for the chance. Sounds great – thanks for the contest. Really enjoyed the first book in this series. Can’t wait to read “The Whispered Word”. Thanks for the review & the recipe. Thanks for the review and recipe. Love Ellery Adams! The Whispered Word sounds captivating and extremely interesting. Scones are such a tasty treat which I enjoy with tea. The 1st book in this series was really good. Would love to win this 2nd title. thank you for the chance!! Ellery Adams is one of my favorite writers. She always leads me into a wonderful story. This looks like another one of her good books. Thanks for the opportunity. Yes please, I love this series and would be honored to add it to my home library. A recent post from Nora-Adrienne Deret: February Means Valentine’s Day and More Books to Love! The Whispered Word looks like a real treat. I hope I win a copy! Would love to read this! Thanks for the chance to win!